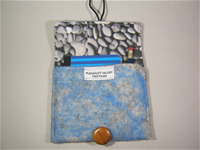 Equally appropriate as men's or women's gifts/accessories or bridal-party gifts, Pleasant Valley Textiles' products are designed and fabricated of hand-crafted wool felt fabric sewn into personal and home decor accessories--purses, electronics sleeves, pillows. Free shipping is available on orders over $300. The envelope-style sleeve is lined with cotton fabric, designed from the artist's photos. The exterior fabric is hand-crafted wool felt, available in several colors, plain, appliqued, or embroidered. The button-loop closure features either a natural or vintage button. 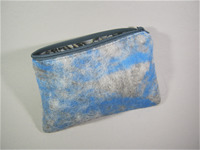 The small zipper pouch is approximately 4" x 7" and includes a removable wrist strap. The large zipper pouch is approximately 7" x 9" and also includes a removable wrist strap. Like all of Pleasant Valley Textiles' products, it is fully lined in cotton printed from the artist's photograph. The exterior fabric is hand-crafted wool felt available in several colorways; here it is light grey with blue contrast (autumn skies). The zipper is manufactured in IL; cotton lining is printed in NC; some of the wool used in the felt fabric is processed in KY, some is direct from Iceland. The tool roll is approximately 10" x 4" rolled, 10" x 14" unrolled, featuring seven 2" x 4.5" pockets. Like all of Pleasant Valley Textiles' products, it is fully lined in cotton printed from the artist's photograph. The exterior fabric is hand-crafted wool felt available in several colorways; here it is light grey with blue contrast (autumn skies). The buttons are either natural material (wood, horn, bone) or vintage; cotton lining is printed in NC; some of the wool used in the felt fabric is processed in KY, some is direct from Iceland. The notebook wallet comes with a small notebook and pencil. Like all of Pleasant Valley Textiles' products, it is fully lined in cotton printed from the artist's photograph. The exterior fabric is hand-crafted wool felt available in several colorways; here it is light grey with blue contrast (autumn skies). The button is either vintage or natural material (wood, horn, or bone); the cotton lining is printed in NC; some of the wool used in the felt fabric is processed in KY, some is direct from Iceland. Accent pillows are available in a variety of colors, plain, appliqued, or hand-embroidered. The fabric is hand-crafted wool felt available in several colorways; here it is light grey with blue contrast (autumn skies). The zipper, contrasting or complimentary color, is manufactured in IL; some of the wool used in the felt fabric is processed in KY, some is direct from Iceland. The pillows are available with or without pillow form included.